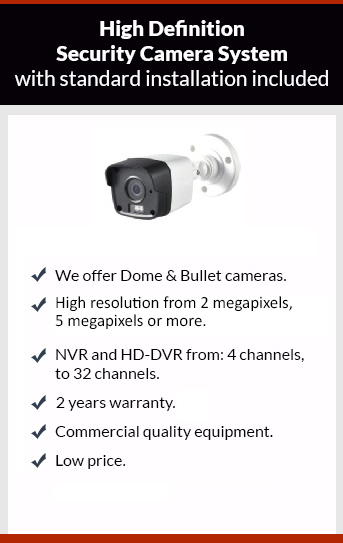 Get affordable Security Camera installation on Anaheim, CA and CCTV equipment with commercial quality and 2 years warranty. We have been working in the city of Anaheim since 2005; we offer professional installations, with low price. You want security cameras for your family security, your business security, or control. You have to ask yourself where you want to place this security cameras, how can cover the zones that particularly appealing to burglars? And if you should put them out of reach? When we visit the place where you want to install your security cameras or surveillance camera, we’ll give an advice of the placement of them the and best type of camera for that specific situation. There are different shapes and different electrical characteristics of the security cameras. All the CCTV cameras can have different resolutions: from 1 megapixel to 5 megapixels or more. You can find them like: infrared, analog, IP, vandal proof, infrared, white balance and varifocal (zoom camera). Bullet camera can be installed on a ceiling or a wall, it has a cylinder shape and is easy to see it. Dome camera can be installed on ceiling or wall (with especial internal 3 axis bracket), has a round shape. It’s easy to find a dome security or surveillance camera on small or medium size with appealing look. When the security camera has infrared capabilities it means that the camera has a night vision. The night vision can be achieved through infrared led, or matrix led located in the front of the camera. Analog camera is the first technology on CCTV (closed circuit television), is old technology. Recently had been changes in analog technologies like TVI, CDI and some more. These analog technologies can give resolutions from 1 megapixel, 2 megapixels (1080p) up to 3 megapixels. IP camera is a digital technology can reach up to 5 megapixels.